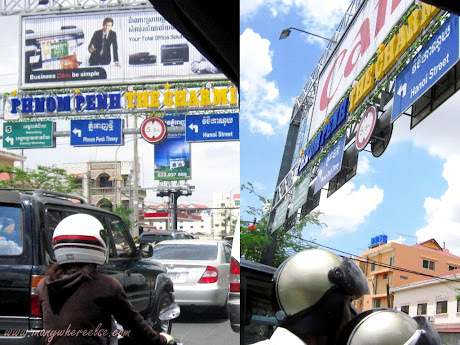 i decided that i would split my travel notes about cambodia into two because phnom penh and siem reap are two different cities and each city has its own character, its own distinct qualities, its own allure and yet, without outdoing each other. combining my thoughts on the two of them may result into a muddled heap of words, giving less credit than what each deserves. 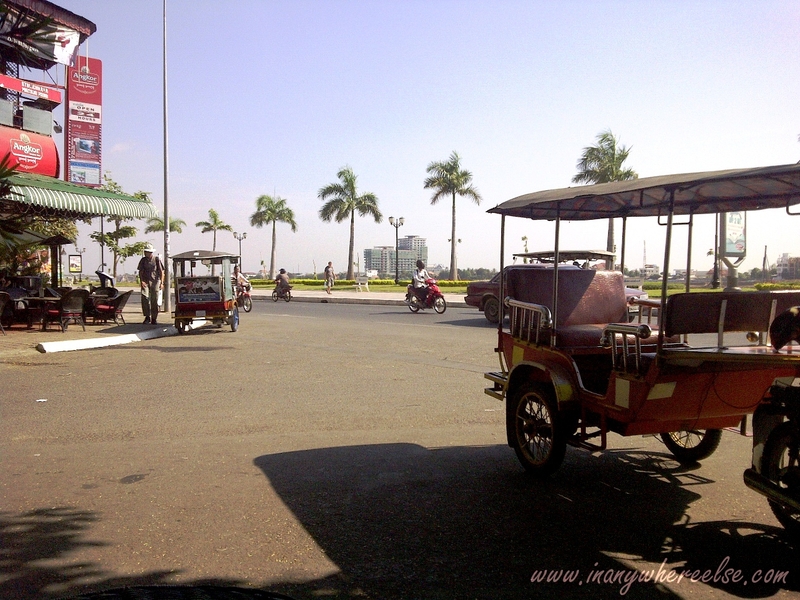 our tuktuk driver sped away to our guesthouse and these 2 stitched pictures were my failed attempts to take the charming city in its entirety. but anyway, i hope the message still gets across. some of my highlights pertain to cambodia in general but i experienced them first in phnom penh and siem reap was a different experience altogether. 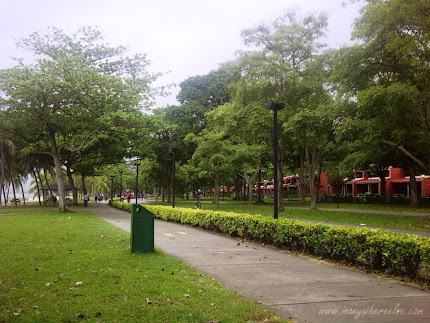 the first time i stepped on the city-state, i was with my brother and i can't forget how he longed to go back to cebu after he had seen how organized things are in this place. he felt that he was always on his toes and he didn't like that. as for me, i'm in the opposite side of the spectrum. i have already enough chaos - figuratively that is, at work and i would deeply appreciate nice and neat things. a lengthy explanation for this random photo. time indeed flies! and i have written about that a lot of times already. i am here in singapore for seven months and before i even know it, my first year could then be knocking on my door! seven months and i have only come up with 5 posts about my stay and most of them were about food. i have been here and there around the island but the mood to write about it seldom comes by. 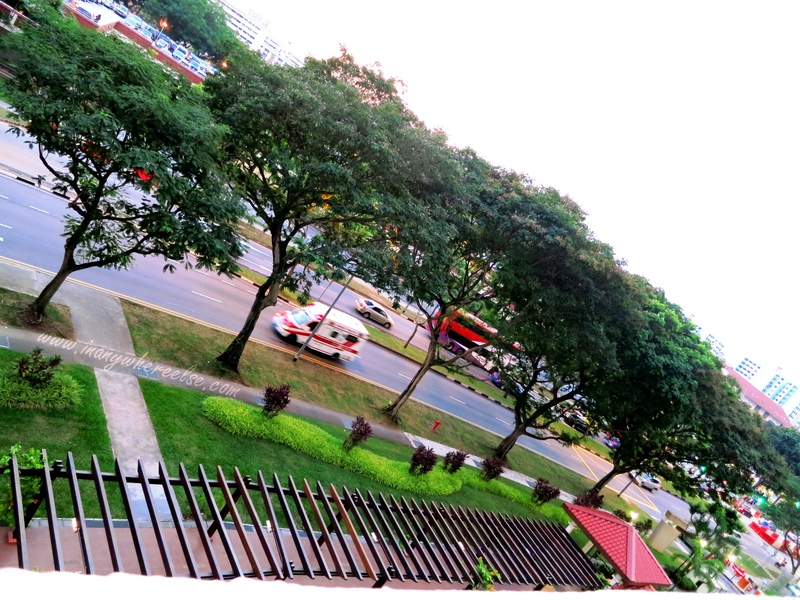 i also would not want to equate singapore as purely work and the stress that most likely goes with it. of course, there are fun times although i think the money here tends to be more volatile especially for a girl, because retail therapy can be done in a breeze and worse, the sale that seems to happen too frequently. to do away from imminent shopping, my best advice i can give to myself is to go to places with outdoorsy feel like parks instead of going to malls and even shops along the streets! we might have spent too little time in phnom penh but the two days were worth it, although technically, we only had about 24 hours in the thriving capital. 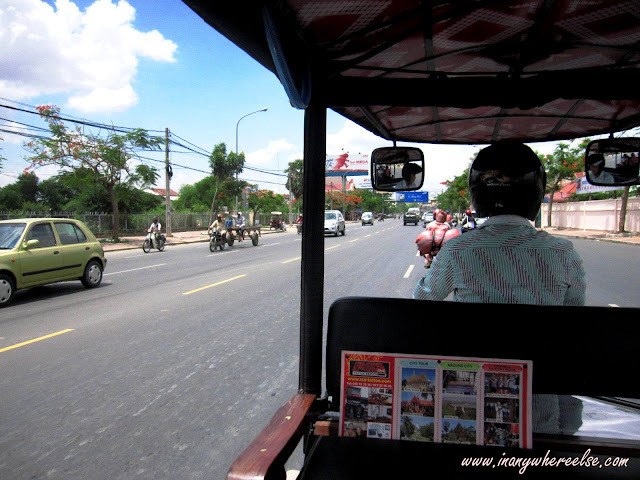 we arrived at noon on our first day and left for siem reap around noon the following day. but who cares? i still like to consider it as two days, given that we had an overnight stay! i'm so random having to argue this triviality with myself. anyway, i seem not to get enough on writing about our host in phnom penh who was indeed a great help to us and in a way, made us let our guard down and a few of our inherent fears in staying at a new place or country for that matter. as i age, i have slowly become a sucker for plans though i'm not into an OC-type of planning because i would very much welcome surprises along the way. part of the plan was to secure our transportation from phnom penh to siem reap before we would go about. it became a necessity since it was the weekend and my brother should catch his one and only flight back to manila in siem reap. i know my brother is close to a perfect companion because he willingly agreed with my plan that he would go to phnom penh to meet me and head back to siem reap to catch his flight the day after. he was intrigued with phnom penh's history so i like to think that we had a win-win situation. haha does this make me an evil sister? back to our host in our guesthouse, mr. seng. 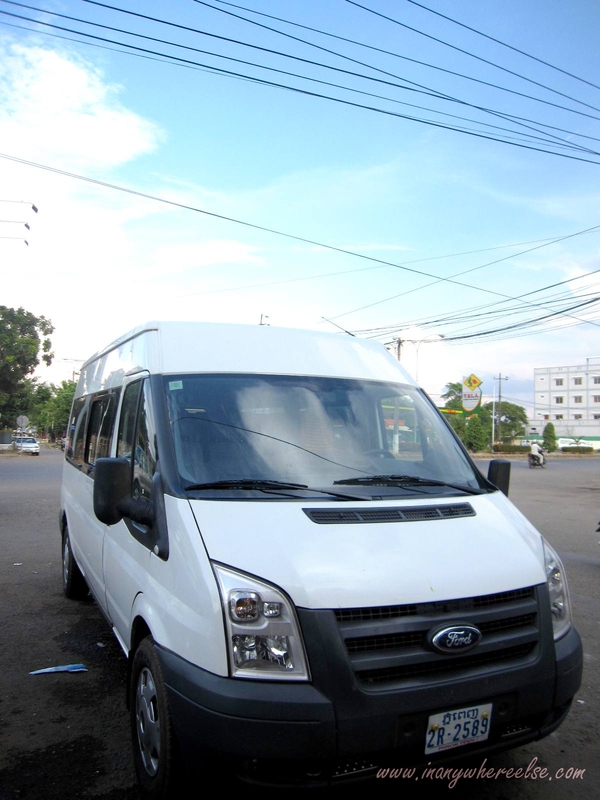 he was the one who booked for us with our transport to siem reap which was scheduled the following day. he even echoed my concern that we should book in haste or face the grave consequence of paying hefty re-booking fees for my brother. we dreadfully thought that the air-conditioning in our room was not fully working since it took a long time before the temperature drop spread the entire room. it was probably the intense heat outside, that challenged the air-conditioning's noble functionality. so noble indeed that we comfortably fell in a deep slumber under the thin sheets, while the air-conditioning tried its hardest until it felt like springtime. although it became a slow drag in the morning and the coolness tempted us to snooze for just a teeny bit, we had no choice but to start our day bright and early, because we only had a few more hours left in phnom penh. we would then go north to siem reap after lunch. 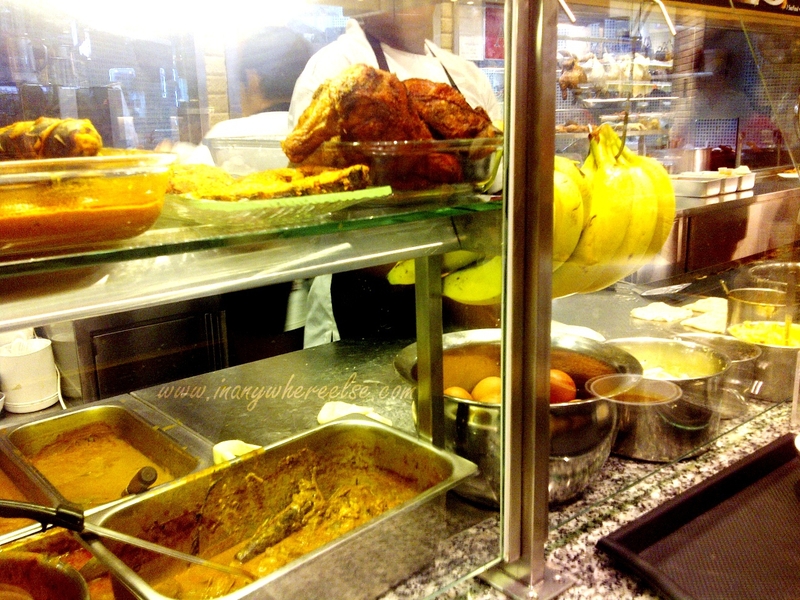 most of the time, we stopped by to eat at any place we fancied at the moment. one of these instances was when we tried phnom penh's local ice cream. after eva and i did a bit of routine exercise with our dancing feet at wat bottom park, the three of us (with my brother who's not keen on dancing) were lured by a local ice cream shop right across the park. 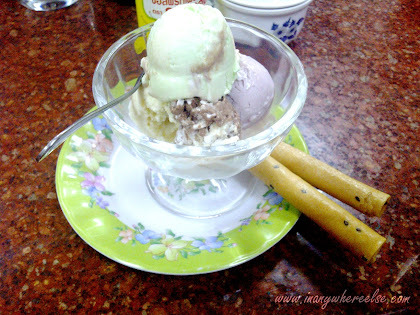 the shop was called songtrah ice cream and it was filled with locals, having their cold fix after a hot day. then as we made our way back to the area near europe guesthouse, passing along the sisowath quay, we again made another stop for yogurt though it wasn't a local shop but an international one. the distance in between the local ice cream and this yogurt was just a half kilometer away. phnom penh was so laid back that our appetites went sky high! i had been forewarned enough that april is incredibly hot in cambodia. i had read the fair warning in the articles about cambodia online but impudently, i shrugged them off. in other words, the weather was the least of my concern. his name was "nan". he greeted us at the airport's arrival area, carrying a bond paper with my name on it and after a swift and awkward handshake, he led us outside the airport's perimeter, passing by plush cars that were sun-dried in the parking lot. he turned his gaze to us from time to time in case eva and i mistakenly opened a car's door, eager for the air-conditioning comfort. my thoughts went haywire because all he could muster were an amiable smile and few hand gestures to direct us to the right way. he might not be able to carry on a long conversation in english but we did get along just fine.